In 1868, a group of Irish settlers in western Douglas County banded together to found a Catholic Church in Elkhorn, Nebraska. Because of their heritage they very appropriately named the parish in honor of St. Patrick. For the first several decades, the community was served by “itinerant priests,” Fr. Wallace from St. Patrick’s in Gretna or Frs. James Bruke and Tom Walsh from St. Peter’s in Omaha. The first church building of the parish stood high on a hill in the community of Elkhorn, but was destroyed by fire in the same year of its construction. The early pioneers rebuilt the church one year later, only to have adversity strike again in 1872 by tornado. Reconstruction took place in 1873, only to have that building consumed by fire again in 1899. In 1900, St. Patrick’s Parish became a mission of St. Columbkille’s Parish in Papillion, and was served by Fr. Henry Hoheisel. Under his guidance, a new church was built at 311 Pacific Street, one block west of Highway 31. Even though the building was sold years ago, it remains standing as a reminder of hardships endured by those early pioneers. Fr. John Brock arrived in 1931 and served the people of St. Patrick’s for 25 years. The parish grew and church renovations took place during his tenure. Fr. Brock celebrated his “Silver Jubilee” as a Catholic priest on May 21, 1946. The men of the parish honored Fr. Brock by naming the local Council of the Knights of Columbus in his name. The year 1956 brought with it the appointment of Fr. Martin Petrasic, “Fr. Pat”, as St. Patrick’s pastor. At the time of his arrival, there were 81 families registered and rapid growth ensued. A parish center, known now as “Boland Hall”, was constructed in 1966 at the intersection of Hwy 31 and West Maple Road, the current parish location. Parishioners converted a section of the building into their worship space in 1969, with a rectory added shortly thereafter. The present worship space was built in 1981 and formally dedicated on March 7, 1982. Fr. Nelson Newman then served as pastor of the community from 1984 through 1993. During his time as pastor, a new Parish Center, located below the church, was completed and plans were made to open an elementary school in the fall of 1993. Fr. Robert Irwin arrived in June of 1993, becoming pastor of St. Patrick’s for 4 years. On August 29, 1993, Archbishop Elden Curtiss dedicated a new parish grade school, but success was not to be. The school struggled for two short years, and then was forced to close its doors. Hard lessons were learned, but served as guideposts when the parish re- opened its school on August 23, 2000 with 80 children. April 1997 marked the departure of Fr. Irwin to Fargo, ND, and Rev. Paul Mahowald, SJ as interim pastor. Then in June 1997 Fr. Ron Wasikowski took the reigns as pastor of our faith community. 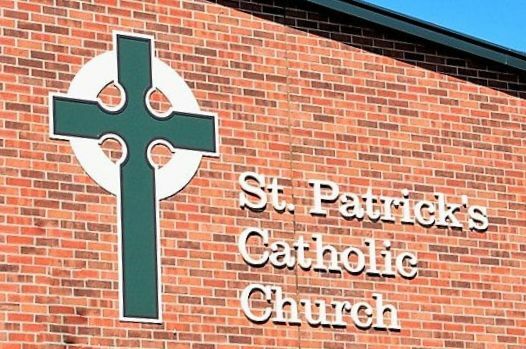 During his 13 year tenure, St. Patrick’s community experienced tremendous growth and underwent several renovation and expansion projects. August 23rd, 2000 – St. Patrick’s School opened with a three-year old program (19), a pre-kindergarten program (30), a kindergarten class (17), a first grade class (7) and a second (5)/third grade (2) combination classroom. December 3, 2000 saw the re-dedication of St. Patrick’s renovated “House of the Church.” Our seating arrangement was reconfigured, expanding capacity to approximately 700. The clerestory and better lighting were added, along with newly designed liturgical furnishings. The result has had a tremendous impact upon the quality of our liturgical prayer. As the Elkhorn area continues to grow rapidly, a well-designed yet flexible Master Plan is helping to provide guidance in meeting the needs of St. Patrick’s Parish-Family. Construction of the first phase for a new school/RF complex was completed in March 2002, providing nine classrooms, school and RF offices, administrative space and a commons area. The pre-school/kindergarten phase was completed in August of 2003. The third phase, the Academic & Faith Formation addition, was dedicated August 23, 2008. Early 2009 brought another addition to St. Patrick's. The evergrowing parishioner base warranted the addition of an associate pastor. Fr. Rodney Adams joined the staff A couple of years later the parishioners gifted Dolly (a miniature Yorkshire Terrier) to Fr. Rodney, and she became a regular in the halls of St. Patrick's. In June 2010, parishioners graciously bid farewell to Fr. Ron and warmly welcomed a new pastor, Fr. Gary Ostrander. Ordained in 1971, Fr. Gary brought a wealth of experience and wisdom. His spiritual leadership and homiletic prowess melded seamlessly into the dynamic here at St. Patrick’s Catholic Church. Fr. Tom Fangman came to St. Patrick's to serve as pastor in July of 2016 from Sacred Heart Parish. He served their for 19 years as the pastor. Fr. Gary remains as senior resident and helps Fr. Tom in serving the needs of this growing parish. Fr. Rodney Adams was assigned as pastor of St. Mary Magdalene Parish in Omaha. and Fr. John Norman became Associate Pastor at St. Pat's. Fr. John's time was short and he moved in August 2017 to be pastor of St. Peter de Alcántara Parish in Ewing, St. John the Baptist Parish in Deloit Township, and St. Theresa of Avila Parish in Clearwater.